ITALY – Overseas Filipinos will soon enjoy products and services soon to be offered by the Overseas Filipino Bank once it opens in 3 pilot foreign offices in Abu Dhabi, Dubai and Bahrain. During the command conference held in Milan, Italy, LandBank President and OFBank Chairman Alex Buenaventura presented the OFBank to ambassadors of the Middle East, Europe and Africa, Consuls, Consuls General and Heads of Posts. The OFBank will be launched by President Rodrigo Duterte within the second quarter of 2018 in three pilot foreign offices. “Our strategy is technology. Technology now is already through the internet with the use of mobile phones. The OFBank will have its own website so overseas Filipinos can do their transactions at the comfort of their own homes,” Buenaventura said. Buenaventura also discussed 15 products and services overseas Filipinos can avail of, including cheapest, fastest and most convenient mobile credit-to-account remittance service; investment products; payment services for government agencies, utility bills, education and insurance; housing, business, all-purpose, study-now-pay-later loan products; and deposit products. “This is the most modern and I think it’s where the remittance system for overseas Filipinos should go. Fast, safe, cheap and convenient,” he said. 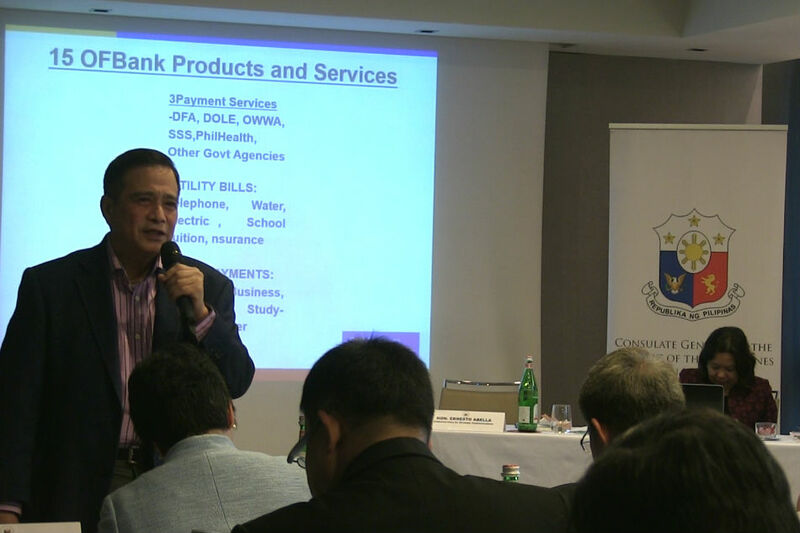 OFBank will also have service delivery strategies that will develop an online banking interactive website through which platform overseas Filipinos can perform electronically all transactions from opening of account to deposits to loans and payments or for credit to ATM account of their beneficiaries with any of the 423 branches of LandBank. It also comes with an auto text remittance advice to beneficiaries who can withdraw from ATM machines 24/7.